Consumer pollution refers, in part, to traces of numerous consumer products, including pain relievers, prescription drugs, antibiotics, insect repellent, sunscreens, and fragrances—collectively called pharmaceuticals and personal care products (PPCPs)—discovered in inland and ocean waters. Between 1999 and 2000 the United States Geological Survey (USGS) established the widespread occurrence in the environment of minute but measurable quantities of PPCPs, along with other organic wastewater contaminants, such as detergent metabolites , plasticizers, and fire retardants. These contaminants were discovered in 80 percent of 139 waterways downstream from sewage treatment plants and livestock operations. Before 1999 most research into PPCPs took place in Europe, and pharmaceuticals were detected there in sewage treatment effluent, surface water, groundwater, drinking water, and the North Sea. Thousands of PPCPs are consumed worldwide, some on a par with agrochemicals, at rates of thousands of tons a year. These substances enter the environment largely from sewage treatment plants, as well as directly from fish farms, storm runoff, recreational activities, and leaking landfills. Incompletely metabolized drugs or their metabolites—chemicals formed from the body's interaction with the drug—are excreted in the urine and feces of humans and animals. Cosmetics and perfumes are washed off in the shower. Unused drugs are flushed down the toilet or thrown out in the trash. Antibiotics, steroids, and other drugs that are used to treat animals, such as those in confined animal feeding operations, are eventually washed into sewer drains or directly into local waters from roads and farms. Sewage is treated to break down human waste, but the wide occurrence of eighty-two out of the ninety-five substances tested for in the USGS survey indicates that many synthetic chemicals are not completely removed by sewage treatment methods. PPCPs in wastewater effluent end up in rivers, lakes, and oceans, and contaminants in manure or sewage sludge are spread on land. The concentrations of PPCPs found in the USGS survey range from parts per trillion (ppt) to parts per billion (ppb), or nanograms per liter to micrograms per liter. For pharmaceuticals this is many orders of magnitude below the concentrations prescribed as medication. more by pollutants if they are exposed to efflux pump inhibitors (EPIs). EPIs decrease the cell's ability to expel potentially harmful substances and are prescribed to help drugs pass through cell walls. Another concern is that fish and other species constantly exposed to mixtures of low levels of PPCPs will be affected in small, undetectable ways that lead to irreversible changes over time. Such small shifts in behavior, immunology, and reproduction may be attributed to natural adaptation and may not be recognized as a consequence of pollution. Seventy-five percent of streams in the USGS survey contained more than one contaminant, and 13 percent contained more than twenty. The presence of antibiotics in 48 percent of the streams and potentially in soil that is overlaid with sewage sludge could be a factor in the increase in antibiotic resistant strains of bacteria. There is also a potential threat to human health. Recharging groundwater from surface water constantly infused with treated sewage effluent could result in PPCP contamination in drinking water. Some pharmaceuticals, including clofibric acid, have been detected in parts per trillion in drinking water in Germany. Clofibric acid is a metabolite of drugs taken by many people to reduce cholesterol levels in the blood. The long-term effect of swallowing very low, subtherapeutic amounts of multiple medications simultaneously many times a day for a lifetime is unknown. Scientists in Germany are researching treatment methods to remove PPCPs from wastewater before it enters rivers and oceans, and from potable water. Results to date show that ozone treatment and/or filtering water through granular activated carbon effectively removes the pharmaceuticals commonly found in drinking water in Berlin. Research in the United States in 2002 is aimed at establishing where and in what concentration organic wastewater contaminants, including PPCPs, are found. PPCPs are not currently part of any water-monitoring program in the United States. The USGS is conducting a survey of these contaminants in groundwater and in sources of drinking water. Other research is focused on the presence of pharmaceuticals, including anticancer drugs and anticonvulsants in wastewater and drinking water. Some scientists are proposing research to find out which PPCPs are harmful, especially to aquatic species, and how these chemicals work at the molecular level. Scientists also want to study whether exposure to a combination of different pharmaceuticals at low concentrations, especially those that work in the same way, poses a risk to humans or wildlife. Research is needed to develop analytical methods sensitive enough to detect traces of all the different pharmaceuticals and active ingredients in personal care products and to develop new ways for measuring subtle rather than acute toxic environmental changes. Source reduction, recycling, and replacement with "green" pharmaceuticals could help reduce excess or unused, expired medications. Disposal advice on packaging could recommend that drugs be recycled or disposed of in a controlled manner. Reducing the number of pills per container could reduce the amount of expired medication. Drug manufacturers could also find ways to minimize excess expired inventory. In the United States, the Food and Drug Administration requires an environmental assessment for new drugs when manufacturers predict that one ppb or more will enter the environment. The drug is then tested for acute toxicity, such as whether it causes cancer. Although most individual contaminants measured in the USGS study had concentrations below one ppb, the maximum total concentration of the thirty-three suspected or known hormonally active compounds was fifty-seven ppb. Some scientists argue that individual concentrations may not be significant for predicting risk, but concentrations of all drugs that behave in the same way should be considered. Health Canada is at the beginning of a regulatory process that will require environmental assessment of products regulated under Canada's Food and Drug Act. In Europe, since 1998, pharmaceuticals used in veterinary medicine must be tested for their environmental effect before they can be registered, unless the concentration predicted to enter groundwater is less than 0.1 ppb or less than ten ppb for drugs in soil. Similar standards are being considered for regulating pharmaceuticals taken by humans. Testing includes checking for inhibited algal growth, for acute, chronic, or bioaccumulation exposure in fish, for reproductive changes in birds, for earthworm toxicity, and for plant growth. SEE ALSO E NDOCRINE D ISRUPTION ; H EALTH , H UMAN ; N ON -P OINT S OURCE P OLLUTION ; ; T OXICOLOGY ; U.S. F OOD AND D RUG A DMINISTRATION (FDA) ; W ASTEWATER T REATMENT ; W ATER P OLLUTION ; W ATER T REATMENT . Daughton, Christian G., and Jones-Lepp, Tammy L., eds. (2001). Pharmaceuticals and Personal Care Products in the Environment: Scientific and Regulatory Issues. Washington, DC: American Chemical Society. Environmental Protection Agency. 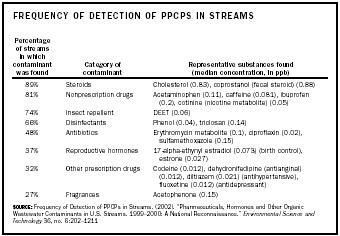 "Pharmaceuticals and Personal Care Products (PPCPs) as Environmental Pollutants: Pollution from Personal Actions, Activities, and Behaviors." Available from http://www.epa.gov/nerlesd1/chemistry/pharma/index.htm . United States Geological Survey. Toxic Substances Hydrology Program. Available from http://toxics.usgs.gov .